This 15-ft. premium VGA cable goes the distance with crisp clarity. 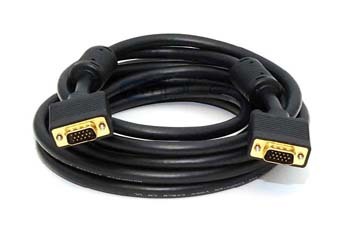 Constructed of premium-grade double-shielded composite, this VGA cable can go 15-ft. and beyond with no problems to deliver crisp video signals without any interference for all VGA monitors, projectors, video splitters, VGA switches, KVM switches and VGA-based presentation devices. No more ghosting and fuzzy images ! This cable uses ferrite cores for maximum protection from EMI interference. You may also use this type cable for connecting between the desktop or laptop PC with our VGA switches, VGA video splitters, or VGA video converters. HD15 male to HD15 male connectors. Molded connector provides strain relief for added durability. Impedance matched at 75 ohms to deliver full brightness and vibrant color. Triple-coaxial and twisted-pair wire provides crystal-clear images. Shielding consists of foil and copper braid with 3 internal coax lines for full bandwidth transmission of red, green and blue signals. Constructed of premium-grade double-shielded video cable to eliminate ghosting and fuzzy images.